A crown (also called a cap) is a man-made cover that protects the top of a tooth. It may be used to restore and preserve a decayed, broken, or cracked tooth. Crowns can also correct some cosmetic tooth problems, giving you a better smile. Restoring your tooth with a crown may take 2 or 3 dental visits. Expectto wait 2 to 3 weeks between appointments. Follow the instructions that your dentist gives you. Before preparing your tooth for a crown, your dentist may first numb the tooth with a local anesthetic. Then, the tooth is reduced and shaped. Any decay is removed. Your tooth may also need rebuilding if larger parts are missing. A mold is taken of the prepared tooth and the surrounding tooth. A temporary crown is applied to protect the prepared tooth between visits. Avoid eating hard or sticky foods. Brush gently at the gum-line around the temporary crown. Carefully floss between your teeth. To remove the floss, pull it out from the side of the tooth–not the top. Your dentist removes the temporary crown and places the permanent crown on your tooth. He or she fits the crown and makes sure your bite feels normal. Once you both agree the crown fits right, it is cemented in place. Your dentist also makes sure that the shape of your tooth has been restored. A crown is made of gold, other metals, or porcelain. It can also be made of resin, or porcelain and metal. When choosing a crown, think about how it will look and how long it will last. Talk with your dentist about the type of crown that may be best for you. Metal Crown: This crown is made of gold or other metals. It is very strong and won’t break. Because this type isn’t tooth-colored, it may not be the best choice for a front tooth. 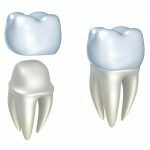 Tooth-colored crown: A tooth-colored crown is made of porcelain or reinforced resin. It comes in a range of shades to blend with your other teeth. This type of crown may be more likely to chip than a metal crown. Combination Crown: Porcelain is fused on top of metal, making this crown appear tooth-colored. The metal at its base makes the crown stronger than a porcelain or resin crown. But it is not as strong as a metal crown. Your new crown will help you chew easily. You may also feel more confident about your smile. Be sure to brush and floss well. Your crown will last longer. And don’t forget to see your dentist as instructed.